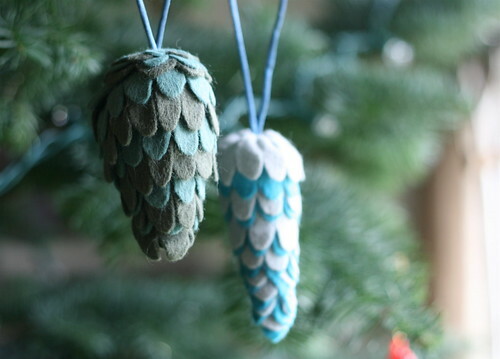 This is a SUPER sweet soft ornament tutorial from our own April Alden. We carry everything you need to make you (and your neighbors) an entire set. Two colors of rayon wool felt, scraps of fabric(for the inside), and a hanging ribbon or cord approximately 7” long. Pins, needle, thread, and scissors. 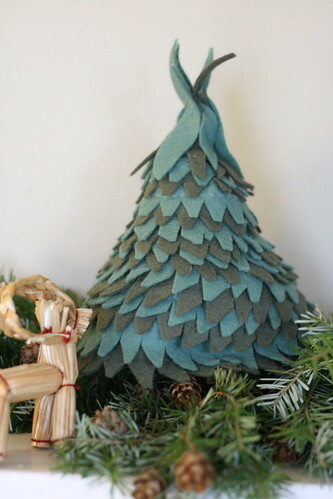 To make a pattern for your pine cone draw a cross shape horizontal 5.5” vertical, 2” on top, and 1” on bottom. Connect the bottom lines and round off the top ones. Now trace and cut a piece of fabric from your pattern— it can be a scrap because you will not see it once the project is done. Take your inside pattern and connect the two sides by sewing them together, turn right side out and stuff with scraps or stuffing sew the top closed. Cut two different colors of felt 18” by 1.5”. Mark one edge every half inch, pin two pieces together and cut a small triangle out of every mark, then round off each cut to make a scallop shape. Take your two scalloped felt pieces and raise one over the other so you can see the second color underneath the first. Sew the strips together across the top of the underlying piece. Start one end of your felt strip at the base of your form. Stitch your felt strips while wrapping them around the base. Finish the top in one of two ways— Option one: cut out a series of flower shaped pieces of different sizes and layer them on top of one another cut a small hole in the middle to thread the ornament hanger through at the end. Option Two: repeat the initial step of making your scallops only make it about 4.5” to 5” long, sew across the top and pull it closed to make a flower shape. Take a small piece of ribbon or satin cording (as shown) for your hanging loop sew it to the top of your ornament. Thread your top flower shape over the hanger, stitch it down and you are done. You can make other types of decorations with this same method. Try not rounding your edges into scallops and let them stay pointy to make a small evergreen tree. For a larger project like a wreath, space the marks only one inch apart and cut small triangles. Wrap the strips of triangles around a foam core or cardboard circle!